We landed at the new ultra-modern airport which, unlike the airport at HCM, is built outside the city. It takes about 40 minutes into the centre of Hanoi by car/minibus depending also on the traffic. The journey passes rice fields and palm trees along the motorway before entering the city by crossing the river. Hanoi looks very different to Saigon. We checked into the 3* Galaxy hotel in the old quarter. A 60 room hotel situated opposite a small park, it is decorated in a harmonious blend of European and oriental style. The rooms are very stylish and comfortable. 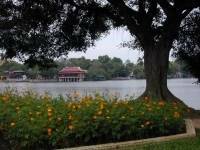 The old quarter and the Chinese district are at the doorstep while the centre of the city and the Hoan Kiem Lake is within walking distance of about 15 minutes. Hanoi city centre lies between the cramped and busy old quarter and the tree-lined boulevards of the French quarter with Hoan Kiem Lake at the centre. Please go out and stroll along the old quarter and the Chinese district until night falls. The atmosphere changes into a street light of lanterns from stalls and bike headlights flashing and flying around like bright insects in the dark. The sound of the motorbikes hooting and the noise of the traffic mixes into a unique picture of the city. The street stalls along the roads and pavements add colour into the picture. It is even more lively and noisy than the old Saigon as I remembered it in the old days perhaps except at Christmas and the Chinese New Year. It is full of life and happiness. 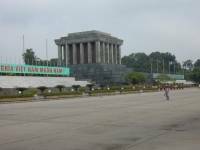 Next morning we started the city tour from Ho Chi Minh's Mausoleum in the Ba Dinh Square. Unfortunately November is the time when his body is sent to Moscow for restorative work each year. The mausoleum is closed until December. 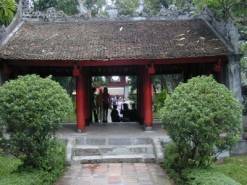 We visited the Presidential Palace, Ho Chi Minh's house, the One Pillar Pagoda, the Temple of Literature and Hoan Kiem Lake with the Den Ngoc Son Pagoda on a small island at the centre of the lake. After lunch we drove 3 hours to Ha Long Bay and checked in at the 4* Heritage hotel. 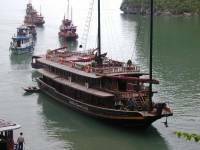 This is an international-style hotel with 101 rooms overlooking Halong Bay. There is a large outdoor swimming pool for relaxation. The hotel is situated right at the centre of the all the shops and the restaurants. That night we had the best meal of our whole trip in the seafood restaurant 'Hoang Lan' in Ha Long. The prawns were as big as my palm and the prepared crabmeat in its shell cooked with egg was delicious. These were only the starters. The main courses included deep fried squid which melted in the mouth, and beautifully steamed fish. This meal was undoubtedly the best seafood we had for the whole journey. We all voted it number 1! Next morning we boarded our boat for a wonderful sailing trip the bay. I had been looking forward to seeing this unique bay of thousands of limestone islands and some unusual rock sculptures jutting out of the sea everywhere. I sat up on deck just enjoying this magical scenery revealing itself to you as the boat sails gently on the calm water passing one big rock after another. The early morning mist created an extraordinary mystical atmosphere on the bay. 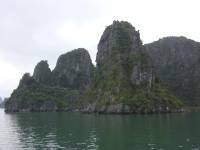 The boat will stop and visit many beautiful caves among the islands during the cruise. The cruise takes about 5 hours or more including a seafood lunch onboard in the dining room. We had another outstanding seafood meal. This time the prawn was fried with hot sauce, followed by whole crabs and lobsters and fish. It was wonderful and delicious washed down again with Tiger beer. The boat can also be booked for an overnight stay onboard as it has 6 twin bedded cabins available, each with private facilites. We drove back to Hanoi in the afternoon and checked in the 5* luxurious Nikko hotel near Thien Quang Lake. This Japanese hotel offers 255 spacious rooms, elegant furnishings, with excellent restaurants. The Dim Sum buffet lunch was particularly good and only $6! The hotel has all the facilities you would expect in a hotel of this class including a large outdoor swimming pool, sauna, spa bath and gym. It takes about 20 minutes to walk from the Nikko to Hoan Kiem Lake. On our last night in Hanoi we were taken to the famous and unique Vietnamese Water Puppet show. It's an hour of pure entertainment with music, colourful puppets of dragons, fish and human figures appearing and disappearing from the pool of water on stage. It is something that you will never have seen before. 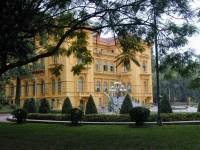 We left Hanoi in the late afternoon and arrived back in the UK the next morning, early. I hope my journey will give you some ideas about the tours and places that you will see if you join us. Of course there are many other areas that I have not been able to cover in this short 8-day trip but we are here to help you to tailor your itinerary to suit your requirements. I will be pleased to assist you decide which tours to take and which hotels to stay. I have inspected all the other hotels that are listed on my website, but it is important to note that all the hotels are comfortable, air-conditioned and spotlessly clean with en-suite facilities regardless of the star rating. During your tour you will have your own personal tour guide and driver. I hope you will come and experience my beautiful country in the near future. Our cruise boat had plenty of room for 6!